One of the things I like best about cruising is that I almost immediately become synchronized with the sun. My eyes pop open just as the horizon becomes rimmed with pink, I go-go-go all day, and and I try to have my anchor down just before the sun dips into the western marshes. I tidy up a bit, make a simple dinner (Note to self: blog about eating while cruising! ), try to write a bit or practice on my tin whistle (my newest passion), and pretty soon, it's time for lights out. I would love to be bored, but there just isn't the time for it. Mainly because sometime during this seemingly idyllic day, something almost always goes wrong! Maybe 'wrong' is the wrong word. 90% of the time, the problem is caused by my own mistake. This is natural, because if you try to do something difficult for 10 hours a day, where many of your decisions and even simple actions must be right, you are bound to make a wrong decsions, or have a lapse of attention. Lapses of attention tend to be punished immediately. I ran aground yesterday after getting distracted by a fender dangling over the side. My father had a passion for not leaving fenders over the side. I try to keep his more crazy influences in check, but I'm not usually very successful. This time was no exception. I checked to make sure my Tillerpilot had us on course, then went forward to pull in the fender. Was I out of the cockpit for more than 3 seconds? I doubt it. I returned to the cockpit, satisfied that I no longer looked like a duffer with a fender hanging out, and when I looked up to check our course, noticed that the bank looked mighty close... just before running up on a mud bank. Moving my weight forward and out to the shrouds must have heeled the Blue Moon over a bit, which changed the shape of her underwater profile, which threw her off course. The Tillerpilot would have corrected, but in the narrow channel, didn't have time to respond. Result: grounding. Aground. Fender decorously on board. My first reaction was, "What rotten luck!" But was it? I've been thinking about this, and have decided that it wasn't bad luck, at all. It was just a bone headed mistake. One that you are bound to make if you cruise long enough on the ICW. This was my third time aground in about 1000 miles. Not bad, really. What did depend on luck was whether the tide was rising or falling. After all, when you run aground is a matter of luck. And in fact, the tide as rising swiftly. So swiftly that I hardly had time to read a few pages of "Swallowdale" before I felt the Blue Moon's long keel springing off the bottom. A few minutes later, I was on my way north, again. I would call that type of grounding, good luck! I'm now in South Carolina, and realized I haven't said a thing about the beautiful State of Georgia. 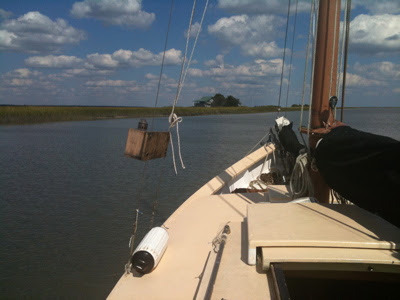 For most of it's way through Georgia, the ICW winds its way through a vast network of marshland and rivers. Often, the mainland is so far away, all you can see around you is grass, golden and waving in the sea breeze. The remnants of a tropical storm passed through the Georgia marshes while I was there. It rained elephants and hippopotamuses, which the swamp easily absorbed. I wasn't going to let the rain stop me, but I did give my new foul weather gear a good testing. It worked great. Thanks Helena! When the storm finally wandered off north to wreak havoc on the North East, we were treated to a full rainbow. Well, I was going to upload a whole batch of Georgia pictures, but my swamp-net connection is running extra slow tonight. I'll continue with my tour of beautiful Georgia the next time I have a decent connection.